Polycell BaseCoat is a unique undercoat for walls that completely covers all common wall imperfections in one easily applied coat. Containing Polyfilla technology, the formulation not only covers hairline cracks, stains, patches and strong colours but also permanently stops them from reappearing – providing the perfect foundation before you paint. A unique undercoat for walls and ceilings that completely covers all common wall imperfections. 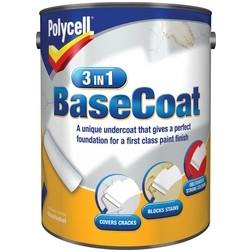 Permanently covers cracks, stains and strong colours in just one coat. Easily applied with a roller, straight from the tub. Make sure surfaces are clean, dry and free from loose particles and mould. 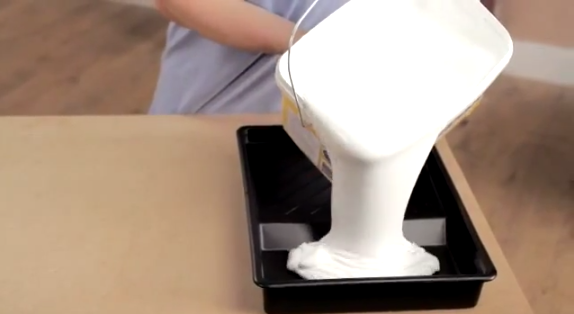 Stir the product well and transfer to a roller tray for easier roller loading. You’ll get the best results by using a short pile roller (up to 5mm or 3/16″). Apply the product evenly to the wall. Try to avoid overspreading. Polycell BaseCoat Complete can also be applied by brush. Remove any splashes of product immediately before they dry. Wash tools in warm soapy water immediately after use. Allow Polycell BaseCoat to dry for 4-6 hours. Your wall is now ready to paint – follow the paint manufacturers guidelines.